In Germany, the owner’s data must be affixed to a sticker on the device. In many countries, however, the sale or use of unmanned systems is not regulated, which can also make them a „terrorist tool“ for the military in the field. The German government writes that small UAV’s have „proven to be a versatile technical aid in the planning, execution and evaluation of operations by terrorist organisations“. In the meantime they have been used for „airborne reconnaissance and espionage, to identify potential weak points in the run-up to attacks as well as to direct plunging fire“. The Bundeswehr uses an old radar (Image: Wikipedia, in the public domain). To detect unwanted drones, the Bundeswehr uses a „light battlefield reconnaissance radar“ from the French arms company Thales. It serves the reconnaissance of moving targets on the ground and at low altitudes. The technology is only poorly suited for drone defense, because it must also detect false alarms, such as birds or drones that are under license for commercial or official purposes. Now the Bundeswehr is upgrading its arsenal for defence against small UAV’s. Five stationary systems are being purchased for the protection of barracks. They are to detect dangerous drones and also render them harmless. In addition, the Bundeswehr wants to buy 30 „portable interference equipment“. This „HP 47+“ device comes from the company H.P. Marketing & Consulting Wüst GmbH, which specializes in jamming transmitters. The manufacturer writes about the mode of operation that drones could be forced to land or „sent back to the starting point“ in order to identify the controlling person. The devices used to discover the drones are also soon to be replaced by new technology. The Ministry of Defence has commissioned a study from IABG to identify and classify an approaching aircraft using different methods. The first detection and subsequent tracking of the flight path can be carried out with motion detectors and cameras. Different sensors simultaneously analyse movement, appearance, electromagnetic or electrostatic emissions or temperature. The UAV’s can also be identified by their noise or the radio frequency of the remote control. Such methods are being researched in Germany by six different Fraunhofer Institutes, including radar equipment with an alleged range of several kilometers, directional microphones and laser rangefinders. The Airbus spin-off Hensoldt also sells a system for detecting and disrupting drones (Photo: Hensoldt). The recognition systems compare the information with a so-called signature database. It contains optical, acoustic and other technical data of known drones. The Fraunhofer Institute for Optronics, Systems Engineering and Image Analysis has presented such a „feature database“. The properties of „a large number of known drone models“ are stored there. After querying the „features database“, the user learns what behavior the drone would show during a „defensive measure“. A distinction is made between „soft or hard methods“ for defence against drones. „Soft“ measures include interference signals that force a drone to land. Individual components (such as the remote control or engines) can be paralyzed using jammers. This technology uses the „portable jamming equipment“ that is now being procured by the Bundeswehr. The course of the drone can also be influenced with a falsified GPS signal. The procedure was allegedly demonstrated for the first time in Manching last week. The „e-compass“ built into some drones can also be manipulated from a distance. It is even possible to disrupt the sensors that regulate the drone’s balance or direction. With some models it should be possible to intercept the video stream and to take over their steering. The police are also increasingly confronted with the unwanted use of commercial UAV’s. German air traffic control estimates that their number in Germany will rise to over one million by 2020. The incidents with drones reported by pilots are also increasing rapidly, and drones are also used for protest actions or unauthorised deliveries to prisons. During a demonstration of WTD 61, a drone is brought to the ground with a net (Photo: WTD 61). The federal police forces themselves do not have their own drone defence system. For operations in which a terrorist threat is assumed (such as state visits or summit meetings), the personal protection officers of the Federal Criminal Police Office (BKA) therefore rent appropriate equipment. In many cases this technology comes from the arms companies. Like the Bundeswehr, police authorities also use the „HP 47“ to defend against drones. Swiss authorities have rented it for the World Economic Forum in Davos; an „HP 47“ was used during US President Barack Obama’s last visit to Berlin. The BKA had also brought along the portable model „SkyWall 100“ of the British company OpenWorks. The martial-looking weapon fires a projectile with a net that can catch a drone. The parcel then sinks to the ground with a parachute. Most recently, also the aviation trade fair ILA in Berlin was guarded with the „SkyWall 100“. The OpenWorks weapon was integrated into the „GUARDION“ system, which the German police had already used at summit meetings in Bavaria and Hamburg. „GUARDION“ is a cooperation of several German arms companies. The system can detect drones and display them in an ESG command system that was originally developed for the military. The British system „Skywall100“ at the ILA 2018 (Photo: Open Works). 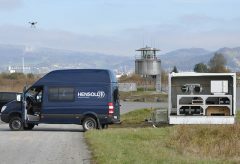 If the aircraft proves to be hostile, it is fought with jammers from the surveillance service provider Rohde & Schwarz. If this remains ineffective, the aircraft is fired at. 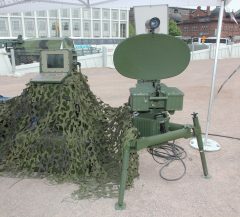 The „GUARDION“ platform uses the „HPEMcounterUAS“ from Diehl Defence. The drones are maltreated with electromagnetic waves, which paralyses all electronic systems. Other companies have even demonstrated the firing of a small drone with a high-energy laser. This „hard“ defence also includes firing with water cannons, a firearm, an attack with „suicidal drones“ or spraying the UAV’s with glue. Under the direction of the Fraunhofer Institute for Communication, Information Processing and Ergonomics, German and Austrian police authorities are developing a platform with arms companies under the abbreviation „AMBOS“, which can be used for various defence measures. The research is funded by the Federal Ministry of Education and Research (BMBF) under the programme „Civilian Security – Aspects and Measures of Counter-Terrorism“ and will end this year. The system will then be used for major events, among other things. The BMBF is financing similar procedures under the names „ArGUS“ and „MIDRAS“. The use of „intercept drones“ is also being tested there. Although the BKA does not have its own technology, it has led two international working groups on drone defense in the past. In the European Union, the issue is dealt with by the police network of personnel protection officers, including the police agency Europol. The dangers of small drones are also investigated as part of a worldwide network of government personal security services. Participants of these „Association of Personal Protection Services“ are police authorities from Poland, the Netherlands and South Korea as well as the Israeli domestic intelligence service. In addition to the technical possibilities, the authorities also exchange information on possible areas of use for drone defence. Together with the US government, the German Foreign Office has launched an initiative against the „terrorist use“ of drones as part of the „Global Counterrorism Forum“. In addition to Australia, Canada, China, Russia, Saudi Arabia and Turkey, the European Union is also involved in the merger of 29 governments. Drones from governmental authorities could identify themselves in the future as mobile phone (Screenshot, YouTube). Research into the defence against drones is also opening up new possibilities for regulating them. This is because detection systems are intended to distinguish „cooperative“ from „non-cooperative“ aircraft. „Cooperative“ means, for example, transport drones or flying cameras that are used for monitoring high-voltage lines, pipelines and conducting surveillance. 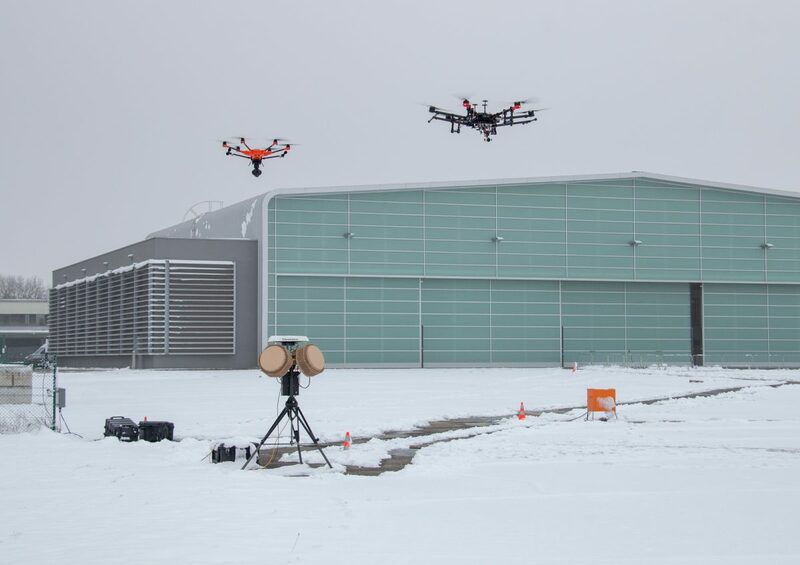 In the „Connected Drones“ project, the Deutsche Flugsicherung GmbH and the German Telekom presented such a platform. The permitted aircraft carry a mobile phone transmitter unit. Using a SIM card, the drone sends position data up to a height of 100 meters to air traffic control, where it is displayed in the air situation picture. Located in this way, unmanned aircraft from the police and rescue services could fly as „specially authorized users“ even in blocked airspaces. Conversely, drones whose telephone numbers are not registered would be identified as „uncooperative“. This data basis is then used to combat them. Image: Drone defence at a presentation of WTD 61 (WTD 61).